A government plane believed to be carrying Algerian President Abdelaziz Bouteflika landed at a military airport outside of the capital on Sunday, amid massive protests calling for an end to Bouteflika's 20-year-rule. The 82-year-old president, who has been rarely seen in public since suffering a stroke in 2013, had spent the past two weeks receiving treatment at a hospital in Geneva, Switzerland. Tens of thousands of Algerians have been peacefully protesting over the past three weeks against Bouteflika's decision to run for a fifth term during the upcoming April 18 election. 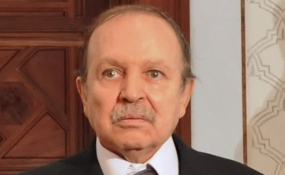 The National Liberation Front (FLN), the top Algerian party backing Bouteflika, said on Sunday that it was willing to work with all parties to end the crisis. Army Chief of Staff Ahmed Gaid Salah also said on Sunday that the military and the people "have the same vision of the future." The statement indicated a possible shift after Salah issued a warning earlier that the military would not allow a breakdown in security. State and private companies staged a partial strike on Sunday to protest Bouteflika's re-election bid. The strike shuttered most shops in the capital Algiers and halted trams, buses and trains run by the striking companies, reported news agency AFP. Thousands of high school students marched peacefully in the capital, while teachers and students occupied several universities in defiance of the Education Ministry's decision to move up spring holidays and close campuses. The protest movement had demanded a change in Algeria's political system that has kept Bouteflika in power over the past two decades. Young Algerians have also voiced anger about unemployment and corruption.